Obachan's Kitchen & Balcony Garden: Happy Saturday Night! In case you're wondering, I didn’t use ground meat for this Mexican treat, because I had some leftover chicken breast fillets. Yes, that’s what the brown thing on the plate is. Spicy food, cold beer and a movie on TV. Mmmmm…. Happy Saturday night. Right now I’m taking a little break before dessert. I just came to my laptop to share my happiness with you all. And ice cream is waiting for me in the freezer now, and my kitchen and living room are pretty clean and tidy because a guy from gas company came to check the gas range/water heater this morning, and tomorrow is Sunday! Yay!! I love Tex-Mex and try to find interesting substitutes for things too! What's the sauce in the background made with? Hi Obachan - This brings back very nice memories of my Mom and I making these....back home in Hawaii, it was what we thought Mexican Food was. Hmm... now I'm getting Mexican food cravings. Oh, sorry, I just used the taco sauce packed in the Taco Kit and didn’t pay any attention to its ingredients. Obachan, your photos are getting pretty good. 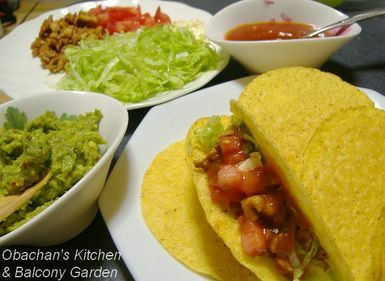 I will send you my recipe for pork carnitas tacos, if you are interested and if I can find it. I just got my copy of the kaiseki book back from the printer and it is too lovely, it is under my pillow now, but I might get a gold chain made so I can wear it around my neck--well maybe not it weighs a lot. Oh, my photos are getting better? Thanks! Yes, I'm interested in the taco recipe. Please email it to me at the address in my profile. I still have 6 taco shells left.